Unfortunately, due to circumstances beyond our control, Adam Design has suddenly been forced to relocate and will not be up and running again until 10 June 2019. We will be downsizing, mainly concentrating on video conversions. For those of you willing to wait to take advantage of our very competitive video conversion rates, which you can check out below, please email us at info@adamdesign.co.nz and we will contact you in June with our new address details, et cetera. We apologise for any inconvenience this has caused anyone, especially those customers for whom we have been doing CD production. We do keep backups of all CD artwork and if anyone requires us to send them their artwork please send an email to info@adamdesign.co.nz and we will contact you as soon as we reopen. We would like to take this opportunity to thank everyone for the loyal support you have shown us during the 26 years we have been operating. Many of you have not just been our customers but have become friends and we are deeply saddened by this turn of events. Transfer your video tapes to digital before it’s too late to save your family memories! Let the experts at Adam Design convert your precious memories to either DVD or MPEG files. Transfer your video tapes to DVD or digital MPEG 2 files now before it’s too late. VHS video tapes gradually degrade over time and another major problem is that VHS tapes go mouldy. Check your old tapes now, if you have precious memories on tape let our experts transfer them to DVD or digital files now. For you security our video conversion service is completed at our offices, we do not farm out to third parties. Once videos are converted to a digital format the digital files can be easily edited. Our video conversions are carried out on dedicated hardware using digital video stabilisers to enhance the video output for the ultimate result, and wherever possible we delete blank areas such as blue screen and bad sections. For your peace of mind we provide a LIFE TIME GUARANTEE on all video conversions. If for any reason your DVD stops playing, even if the DVD becomes broken or scratched, return it along with the video and we will convert it again free of charge. Price includes transferring 1 single video tape and converting it to 1 DVD with label, packed in a clamshell case. 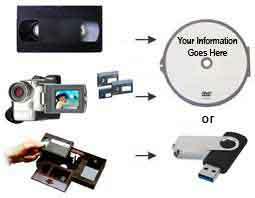 ​Or converting to an MPEG 2 file which can be saved to a USB stick or a portable hard drive. MPEG 2 conversion prices are the same as video conversion. If you use this option and are doing more than one tape you would probably need to supply a portable hard drive or USB drive to save the files on. If you don’t have a portable drive we can supply a 1 TB drive for $95 plus GST which includes copying your files to the portable drive. Some clients prefer to have both options of a DVD and an MPEG 2 file, we can do this for an additional $11.50 including GST per tape. Convert your VHS to DVD or VHS to Digital now that the VHS format is obsolete. While the final result does depend upon the quality of your VHS tape our experience and technology will guarantee that we give you the best result possible. Mini DV tapes are superior quality than VHS tapes because they are already in a digital format and will give a far better result than VHS tapes. VHS tapes are analog and have to be converted to digital. We can transfer and convert VHS and VHS-C tapes to DVD or MPEG even if they are American and Japanese NTSC VHS tapes. In fact we can transfer most tapes to DVD or MPEG files. Although most of our Video to DVD and VHS to digital conversions are done for clients living in Auckland we do have clients sending them to us from all over New Zealand. Click here for F.A.Q. on video conversion.